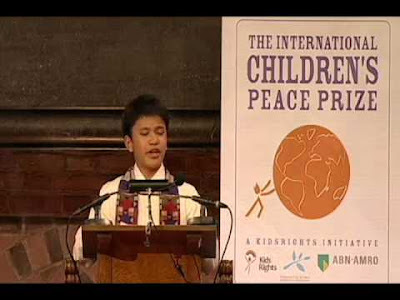 The International Children’s Peace Prize 2012 was presented to Kesz (13) from the Philippines at the Ridderzaal in The Hague today. Of the three nominated children, who have all made extraordinary efforts in the area of children’s rights, the Expert Committee selected Kesz as the winner. He was awarded the prize by Nobel Peace Prize winner Desmond Tutu. “My message to all children around the globe is; our health is our wealth! Being healthy will enable you to play, to think clearly, to get up and go to school and love the people around you in so many ways. To everyone in the world, please remember that every day, 6,000 children die from diseases associated with poor sanitation, poor hygiene, and we can do something about it! For his seventh birthday, Kesz didn’t want any presents for himself. Instead, he wanted to give something to other street children: Gifts of Hope. That same year, Kesz started his own organization, Championing Community Children, aimed at giving street children hope and showing them that they can take their future into their own hands. Every week, he and his friends go to underprivileged communities to teach children about hygiene, food and children’s rights. He even takes things a step further, by teaching children how to teach each other. He has so far helped more than 10,000 children in his local area. "a towering heap of trash in Manila"
This year's winner of the International Children's Peace Prize is an unwanted child from the dumpsite of Cavite, the Philippines. But as luck would smile on this poor kid, he is now hailed as an inspiration for the children of the world. Poverty did not discourage Kesz to serve and do good for his fellow unfortunate children. At a tender age of 13, his story is a drama all told amidst tears and joy, good luck and bad, and of sheer determination and purity of heart in the service of his fellow street children despite the absence of material wealth. I salute this Filipino kid with these haiku/senryu.
. Peace and War .